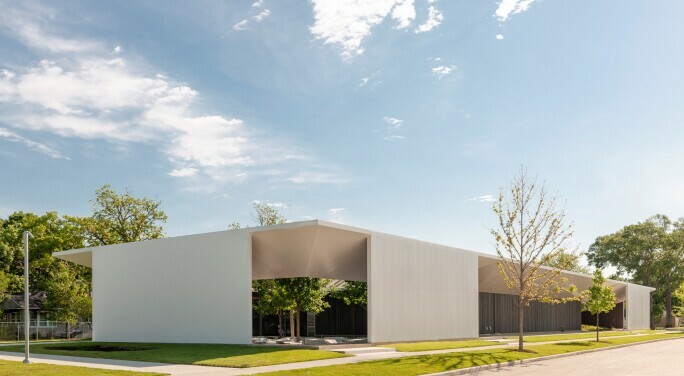 The Menil Collection, a 30-acre campus in Houston, Texas, dedicated to the display and study of contemporary art, opened its first major new building in more than 20 years. T he Menil Drawing Institute, launched in 2008, now has a permanent home where it will continue to develop what director Rebecca Rabinow terms "a national profile" for exhibitions – beginning with a show of American artist Jasper John's drawings – as well as scholarship. The institute, designed by Los Angeles-based architects Johnston Marklee, will be "an intimate setting for the public to interact with the drawings," Rabinow says. Its design takes inspiration from across the campus, which was originally masterplanned by David Chipperfield Architects and includes an award-winning structure by the Renzo Piano Building Workshop. The Exterior of the Menil Drawing Institute, Houston, Texas. Courtesy of the Menil Drawing Institute. Highlights will include a piece Georgia O'Keeffe sent to her future husband, the photographer Alfred Stieglitz, before the two met, and two figural charcoals by Lee Krasner from 1937. The current exhibition of Jasper Johns' marks the release of the catalogue raisonné of the drawings of Jasper Johns, which the Drawing Institute has worked on for the past several years. This major project demonstrates the scope and importance of the Institute's work; the new building finally enables this scholarship to occur in a dedicated space, where the products of the Institute's project can also be exhibited for the general public.